Traditionally, there are four colors in the medicine wheel, and each tribe and or individual may choose any colors they like. It can be based on a dream, vision or another teaching. The medicine wheel represents a philosophy of life and the four colors of man — red, black, white and yellow — here on Mother Earth. The wheel reminds us that we are all related, by embracing this philosophy and concept we are embracing everyone and everything as a relative. Black represents the unknown, the fears we must face in our lives, and the Thunder Being Nations. White represents Spirit Waziyata the Great Giant of the North and Mother Earth's white blanket. Yellow represents the rising sun and each new day. Red represents the road which we travel to the Spirit World during our life. The colors went in this order, but many years ago a prophecy was told about Mother Earth and the changes she was going through, in which the colors changed to remind us that they would not change back until the time was at hand. Around 1995 during a fast and Sun Dance on the Sioux reservation in South Dakota the Spirit informed the people that the time was at hand. The colors were then changed back to the original direction. Medicine wheels are given many different colors, but the main concept remains the same: We are all related. 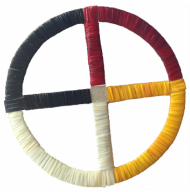 The medicine wheel can be used for decoration on a pipe bags, medicine bag, leather shirts, pipe stems and more.